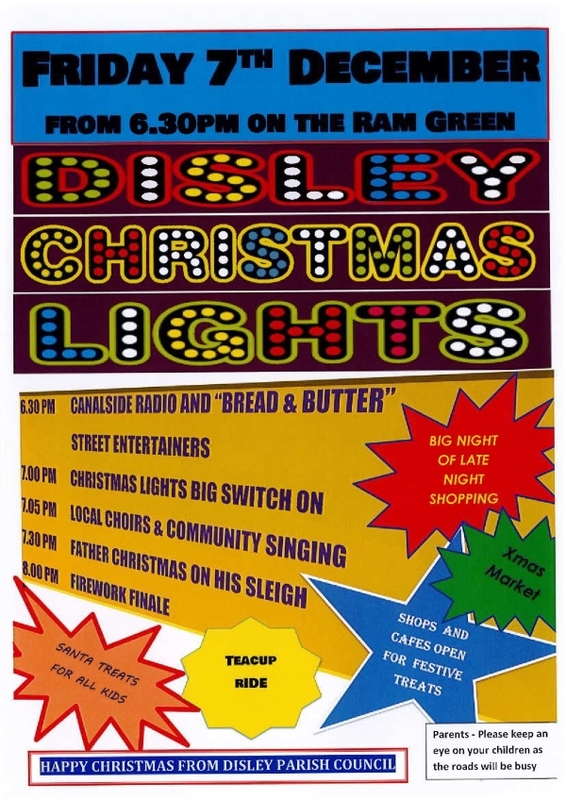 The Disley Christmas Lights Switch On has come a long way since its’ inception 15 years ago. Back then it was a cosy gathering to sing a few carols around the Christmas tree. This years’ event on Friday 7th December is set to be the biggest and best yet. Things start at 6.30pm on the Ram Green with Canalside Radio playing Christmas music and fantastic street entertainers, “Bread and Butter,” spreading festive cheer. For the first time, there will be a teacup merry-go-round for the little ones. At 7.00pm there will be the countdown to the Christmas lights switch-on followed by live music from three local choirs, interspersed with a bit of community carol singing. Father Christmas will then arrive on his super-sleigh before moving into his Grotto to hand out a free Christmas present to all the good little boys and girls. As is tradition, the grand finale will be a spectacular Firework Display. More shops than ever will be opening late on the night offering festive treats and late-night Christmas shopping and the Rams Head will be hosting a Christmas Market.